← What’s in your shopping basket? A neighboring gardener who grows mostly herbs and flowers in her plot was dividing an exuberant lemon balm plant last year and offered me a piece. Lemon balm (Melissa officinalis) is a part of the mint family, so I should have been forewarned that it would spend the winter plotting its invasion and then as soon as the weather improved, start making incursions into the rest of the herbs. I’m going to have to dig it up and replant it in a bottomless flower pot to keep it in check. But it’s so pretty, and it smells wonderful, like a sweet herbal lemon scent, and the bees seem to love it. The rain has caused an explosion of growth so I’ve been trying to keep it pruned until I can replant it. One of my favorite uses for it last year was infusing a quart jar of water with a generous handful in the fridge over night and then using the water to make lemonade. 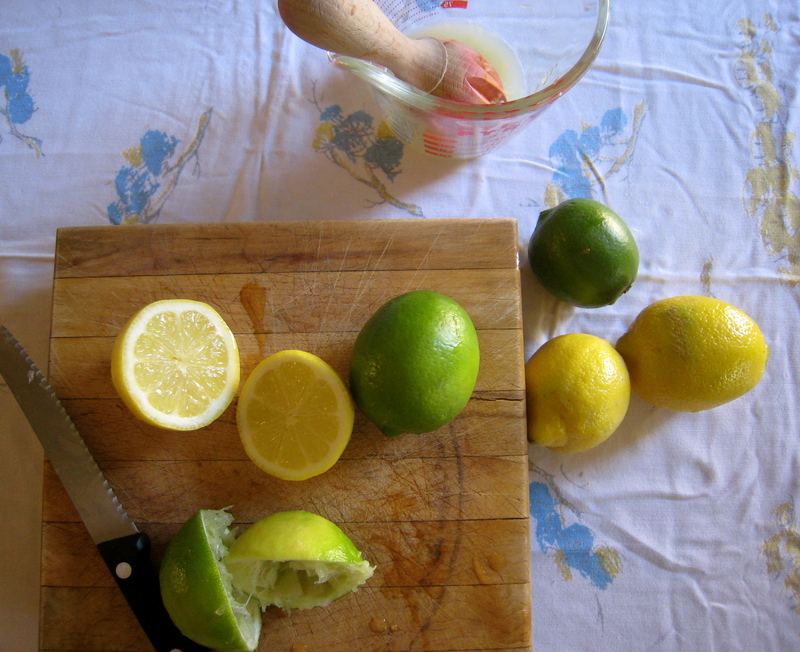 It adds a subtle, herbal, green flavor to sweet/sharp lemonade. It’s a nice variation on a classic. 3 cups of lemon balm infused water. Mix together and serve over ice. Heat together 1 cup of sugar and 1/2 cup of water until it simmers and the sugar is completely dissolved. Keeps indefinitely in the refrigerator. We have runaway lemon balm over about 100 square feet of our back yard. I have tried to make tea out of it… I definitely think subtle is the way to go. Lemonade seems like a good idea. The only other idea I’ve had was to infuse a sugar syrup with it, add lime juice and fish sauce, and use it as dipping sauce for roast chicken. I haven’t tried it so I don’t know if it’s fabulous or just weird. Hmmm- that gets the wheels turning. I might try infusing some rice wine vinegar, the sweeter stuff, instead of a syrup because I like the tartness, but the rest of the formula sounds intriguing. I wonder if I could sub it for lemon grass sometimes. 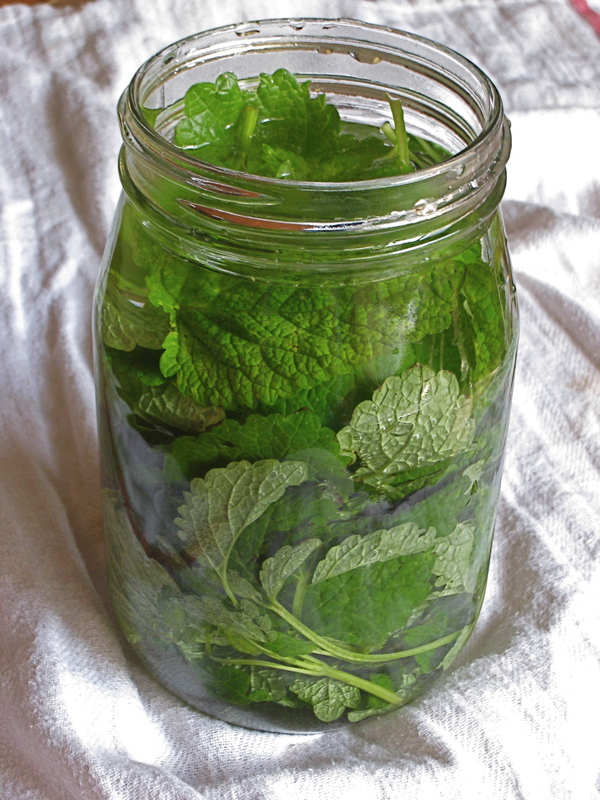 What other more accessible herbage would you recommend for the same technique for those of us without lemon balm? Mint would work really well. 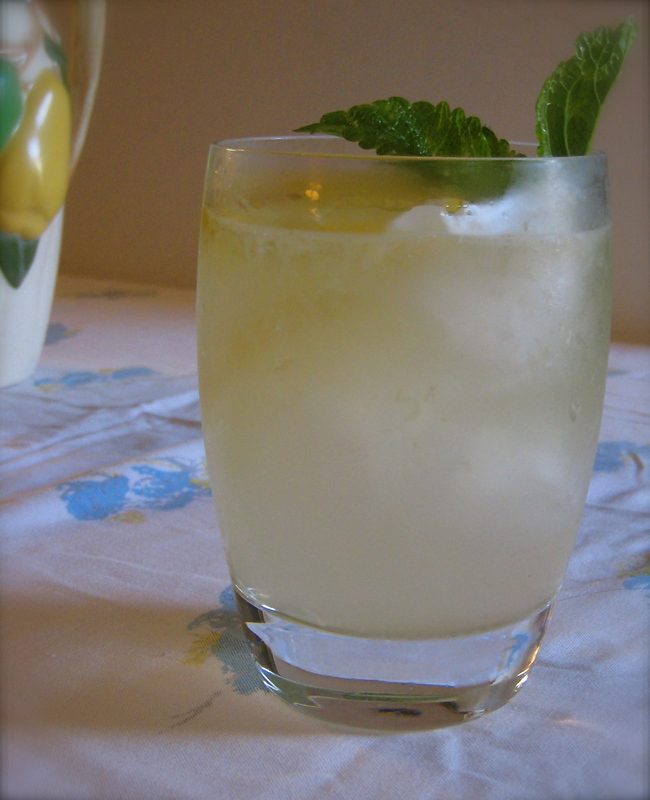 If you have a dripping faucet outside, you could plant a mint and let it run wild.